Information for fundholders goes out soon; ATDs are up! 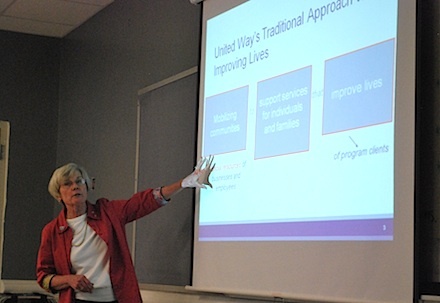 United Way organizations have often been summarily described over the years as “the community’s checkbook.” But this short-hand description doesn’t come close to describing a far-sighted funding model launched by the High Country United Way. Nancy Reigel presents funding concept in Avery County. At 81, Wayland L. Jenkins Jr. decided it was high time he drove to Canada. Alone. He not only went the distance with few stops and no overnights, but made the journey in record time (18 hours one way!). Virgie West May went away to East Carolina Teachers College in 1929 at age 18. She graduated two years later when it was somewhat rare for rural residents to seek a college education, especially women. The North Carolina Community Foundation awarded $7.4 million in grants on behalf of fundholders and affiliates in 2012.